Electrician Liverpool NICEIC approved covering the Merseyside area, fully insured and ready to solve your electrical problems. 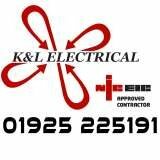 All aspects of electrical work undertaken including maintenance, installation, fault finding and repair. Inspection and testing, electrical reports/surveys. Emergency electrician Liverpool 24 hour call out service. Rewires, part rewires, lights, sockets, consumer units, cookers, showers, boilers, outside lights/sockets. PAT testing and appliance repairs. Emergency lighting, fire alarms and intruder alarms. Public liability insurance, professional indemnity, JIB fully qualified, part p registered with NICEIC, copies of all certification available on request. Got in touch with Gary on a Sunday on a bank holiday weekend as the water pumps in our apartment block had failed due to a fuse in the control panel. An electrician had already been but was unable to replace the fuse or provide a work around. Gary was extremely helpful on the phone and also turned up with an hour of me phoning him, and managed to negotiate with our building manager. He did not carry the fuse that was required but quickly isolated the problem and managed to provide a safe fix by using a trip switch instead of a fuse. Very impressed with the service and Gary's approach to the problem. Will be using his services again and will be recommending his service to others. I contacted Gary regarding the assessment and fixing of electrics in my flat. Although my family live in Liverpool it is not possible for myself to be in Liverpool on a regular basis. This was not a problem when dealing with Gary. His communication was wonderful, I either phoned or emailed him. Phone calls were answered/replied to in a short amount of time, email's were answered within an hour or so. He was able to fully explain all the work he was due to complete, how he planned to do it and why it was required - all without being confusing or patronising. I received, by email, clear and comprehensive copies of the assessments done and invoices due. When I returned home this weekend to check the work I found it to be of a high standard with all jobs completed. Gary had informed me that they had cleaned up after themselves and I can verify this, there was not one bit of mess left from them to note. Regarding the price, I found it to be very reasonable. I would happily use Gary again if I required an electrician and if anyone else is wanting an honest electrician then I would recommend that you use Gary.